A lavish step-by-step cookbook, providing at least 5 inset pictures of each recipe as it's being prepared, with very detailed instructions. Thai desserts are not often made at homes in Thailand, as specialty vendors sell them in shops. Not surprisingly, this is the only authentic book we've found on Thai desserts, and it's a very good one indeed. Thai desserts are made basically from rice flour, sugar, coconut milk, fruits & vegetables and, to a lesser extent, eggs. The selected recipes are simple and delicious. 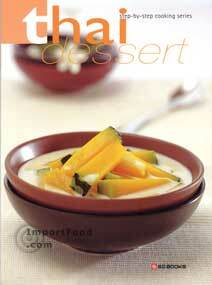 Thick glossy paperback cover, a very high quality full-sized cookbook 7.5" x 10.5". Features a 6 page introduction with explanations and pictures of relevant ingredients. 47 recipes, such as pandan coconut jelly, steamed banana cake, sweet potato in coconut milk, poached eggs in ginger syrup, and black rice pudding. All pages are top quality photo-grade paper, very tasteful pictures. This is not only a good Thai cookbook but also a work of art and great for coffee table presentation. Imported From Thailand. Each recipe written in English. Click image to enlarge.